A few DiSC training tools. One of the biggest challenges for a trainer is finding ways to keep the training in the minds of the participants after you’ve left them. How can you keep reminding them of what they learned? How can you ask them to continue using their new skills or new learning? 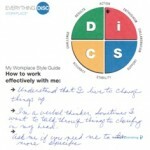 One way to help people keep DiSC in mind is to provide participants with handy and useful DiSC interaction guides and other handouts. These can be given to participants at the end of training or several days later with a reminder that what they’ve learned is easily applied. In our experience, the take-away most frequently kept and used is the Workplace Style Guide. Participants get to create their own DiSC map that’s all about them. Posted to their door, it providers their visitors with a few hints about how to work most effectively with them. Plus on the reverse side is a short summary of how to work effectively with each personality style. It offer reminders to the questions: What should I do when trying to connect? When problems need to be solved? When things get tense? You can order and use these even if you’ve worked with a group using one of the other DiSC profiles such as Sales. They retail for under 75 cents a piece so are inexpensive reminders. There are Interaction Guides for Workplace, Sales, and Management profiles. Their design might look very similar but their content is unique for each profile. Each guide directs the reader to think of someone and then consider if they are more fast-paced and outspoken or more cautious and reflective. This helps them make their first rough judgement about that person’s preferred style. Then they are asked to consider if the person they have in mind is more questioning and skeptical or more accepting and warm. Combined, this information can aid them in determining another person’s DiSC style. Inside the Workplace Interaction Guide you’ll find more details than you will on the back of the Style Guide although the same questions are answered. 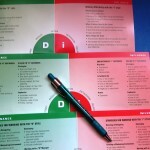 The Customer Interaction Guide, typically used with Sales, provides help for understanding and selling to the four DiSC styles. So you’ll find notes under the topics of Priorities, Is bothered by, Trusts, Sales strategies, and Emphasize. The Management Interaction Guide covers issues such as Directing and delegating, Creating a motivating environment, Developing, and Working with this type manager. Obviously these guides could be of use to anyone preparing for a meeting, whether to sell an idea, to motivate a team, or resolve a problem. These sell for under a dollar a piece. They’ve been updated recently with a new design. Most of these guides are included in the DiSC facilitation kits for each profile. You’ll find even more DiSC take-aways at DiSCProfile.com. Which ones have you used? 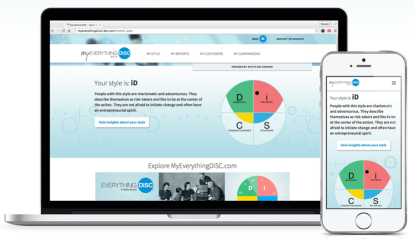 MyEverythingDiSC makes it even easier to keep your participants learning about themselves, their co-workers and DiSC. 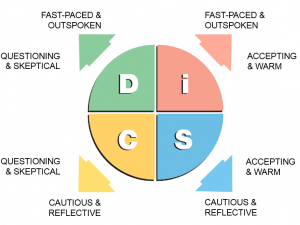 Learners can connect with coworkers or friends who have completed an Everything DiSC assessment. With permission of others, they can review their styles or run Comparison Reports. 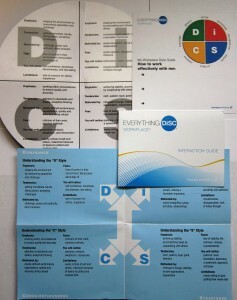 And for those who want to dig deeper into research and theory, MyEverythingDiSC.com has several resources available.